Article: Hummingbirds in the Cook Islands? 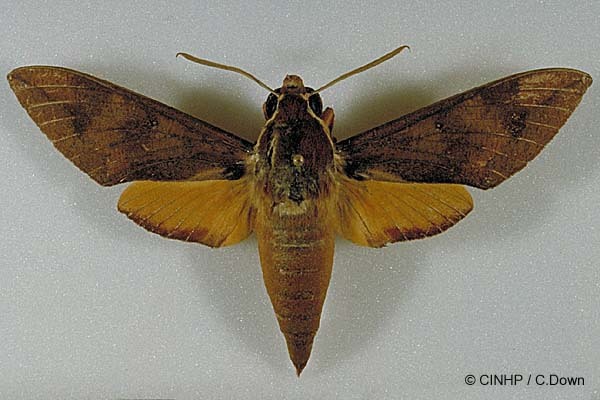 KEY FEATURES: Thickset moth to 5cm TL, wingspan 9cm. 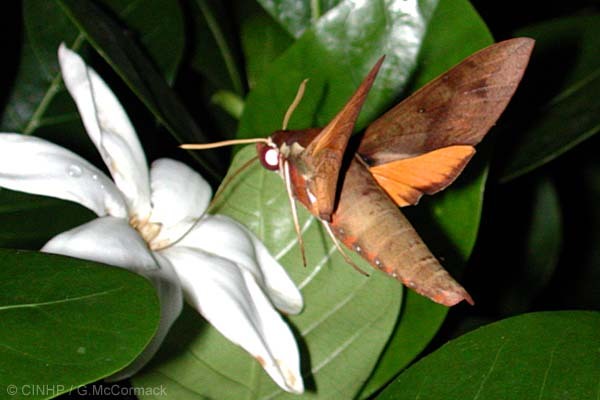 Body brown; forewings brown with faint light and dark markings; hindwings yellow-orange; white stripe from over each eye and over wingbase. Legs white. CATERPILLAR brown or green with white eyespots linked by pale stripe, horn small. NEGATIVE SIGNIFICANCE: Pest. Comments: Calterpillar feeds on morning-glories, including Sweet Potato, Indian Mulberry, Pentas and Grapevine (Vitis). 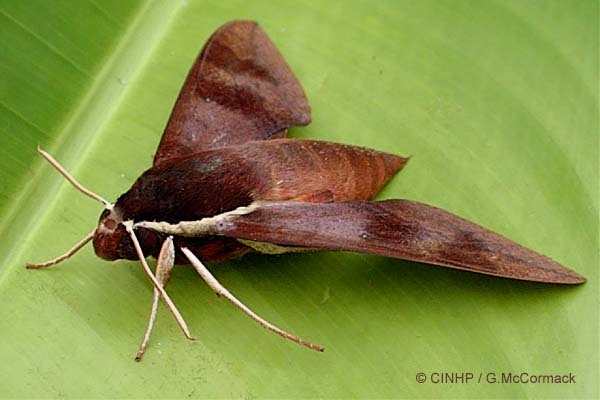 IDENTIFICATION: Thickset moth to 5cm TL, wingspan to 9cm. Dark brown uppers with white stripe over eye and thorax. Forewings fold roof-like, brown with variable light and dark markings; small cell spot and pair of dark brown circular spots near edge, close to body. Hind wings yellow-orange with brown rear border. Underside with variable shades of brown and ochre. Head has large eyes. Head, Thorax and Abdomen dark brown. Legs cream. Antennae cream dorsally and brown ventrally, long, slender with hooked tip. CATERPILLAR brown or green, with dark-ringed white eyespots, linked by a red or yellow line. 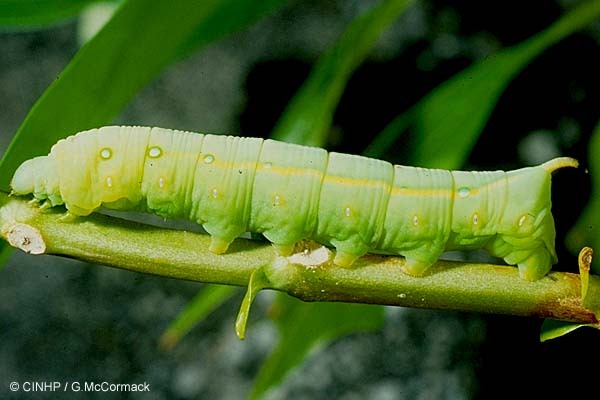 GENERAL NOTE: Caterpillar is a typical hornworm (see Agrius convolvuli), greenish, on foliage of nono (Morinda citrifolia) and possibly other Rubiaceae. Adults feed as does Agrius, and can be abundant around lights. Rarotonga: BESO99, specimen #176, 380, ID J.Dugdale 4/2000. Pukapuka: fieldspecimens+photo, 2/2004, in GR house at night, ID GMcC.